The Adderlink X-USBPRO-US is a Dual VGA, Audio and 4-port USB Extender over CATx. It is a Dual Head VGA, Audio and 4-port USB hub (full speed) that extends up to 300 meters over two CATx cables. 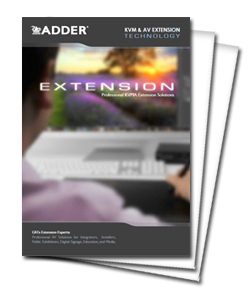 Adder's next generation USB, video and audio extender delivers sharp, bright and high resolution video images and high quality audio for multi screen desktops at distances up to 300m (1000ft) over CATx cables. The AdderLink X-USB PRO MS has been designed to provide industry leading video clarity, compatibility and high rack densities. The X-USBPRO KVM extension system supports crisp and clear industry leading video - high resolution 1920 x 1200 is achievable at up to 300 meters (1000ft). This is achievable by including a variable noise filter which overcomes issues introduced by increased gain as the length of the cable increases over 200 meters (650ft). A Multi-pole compensation technique is used enable superb video quality at maximum distance over a single cable. For the first time, adjustment can be made for cable type and cable length with further color skew compensation and gain adjustment to ensure crystal clear images, all from the receiver's keyboard. For local control of the connected computer, the ADDERLink X-USBPRO also provides local feed trough ports for audio and video at the transmitter unit. The transmitter is powered via its USB port to reduce the need for external supplies. There is also an option for an external power supply if the USB port has insufficient power. Two X-USB PRO units can be linked to a single computer so two users can access the system. Arbitration between the users is handled by the USB sub-system of the computer. This means that both users can control the computer at exactly the same time and the resulting keyboard and mouse influences will be an amalgam of the two inputs. This X-USBPRO extender supports full two page DDC EDID, which some high performance video cards require or they will not deliver optimal performance or work at all. Audio transmission delivers CD quality stereo audio (16 bit sampled at 44.1kHz) to transfer stereo audio from local to remote for Line Out. The ADDER X-USBPRO supports fully transparent USB connections and is able to support all common hardware platforms including PC, Sun and MAC and their associated peripherals. X-USBPRO is also known as X-USB-PRO, X-USBPRO-US, and X-USBPRO-USA. Answer: Thank you for your inquiry. We have uploaded both the manual and data sheet for the AdderLink X-USB PRO on the product's page. Question: What does the US on the end stand for? My product spec calls for the X-USBPRO (without the "US") Is this the same thing?